So if you look at the circle graphs on the left, you will see how many of us are affected (we’re blue, Cancer is red, and Heart Disease is green) on the first graph relative to the other two. The second graph shows the cost from each disease group n the medical system. 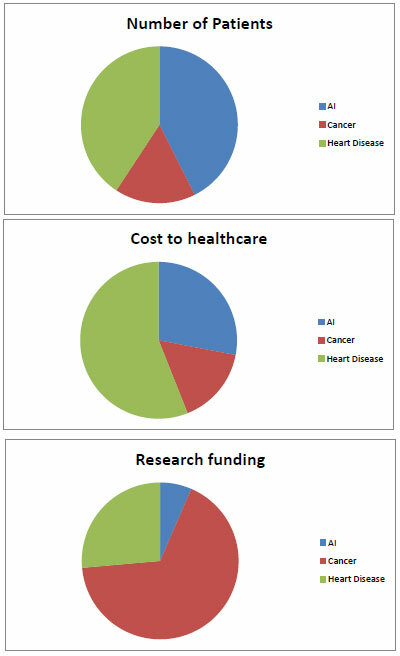 Again, we’re up there (half of Heart Disease but far more than Cancer) and in the last graph you’ll see how much money goes towards research. I’m thinking that we’re not getting the proportional piece of pie. If you want to do something, send a note to your Health Minister and ask him what they’re doing about Autoimmune Diseases and Disorders. I’ve learned that I need to push and be my own best advocate these last two years and it seems like we have to do the same thing here. These stats are from http://www.aarda.org and are from 2003, but they’re the best info I have found so far. That in itself is a tell tale sign. So back to the start of the post. What I was thinking as I was out there using up all of my spoons in one go, was what if the answer is a very simple one that would just require the right minds/specialists to get together and pool their research and wouldn’t cost much at all. What if that’s all it takes. The right push at the right time with the right people. If we added a little more to the blue piece of pie on the bottom pie and that magic moment happened, we could eliminate the entire blue pieces of pie in the upper two pies and open them up for red, green and all the other colours in the rainbow. So there’s something else that you can advocate for. Cross specialty research. It’s kinda like cross training for academics. By raising awareness maybe we can push towards this as a group. Use your connections, your creative genius, your voice. It took me getting sick and fighting for my life to get my voice. Use yours now! You have the power to change the world, don’t wait for something horrible to happen before you realize the power you have within. Yes, thanks for the heads up. I’ve not been here for a while and the spam is piling up. This is excellent. Who posted it?